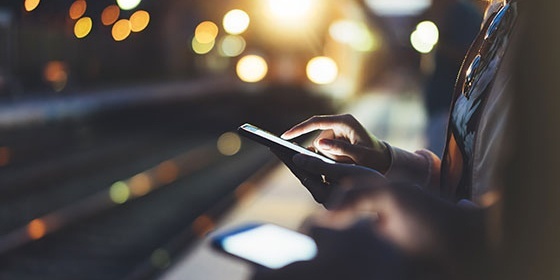 Existing core banking systems no longer support the needs of financial institutions and need to be replaced for a bank to become a truly customer-centric digital bank. The real focus of bank technology changes needs to be on the digitization of core banking. 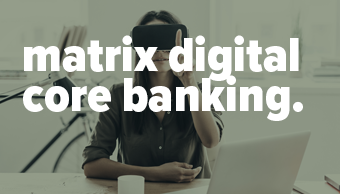 On this page, you will learn what digital core banking is and what the features of a new-age digital core banking system are and get introduced to Matrix accounts: a next-generation digital core banking platform. What is digital core banking? Traditional core banking systems have been continuously modified by hardcoded updates, to cope with changes in business practices and technological evolution. As a result, these legacy systems have become saturated with extra layers of functionality, making them even more complicated and harder to manage. Systems residing in silos can become impractical, and the lack of system interconnectivity can inhibit business growth. Digital core banking focuses on systems of engagement while reducing traditional core banking mainly to data storage, allowing the banking platform to focus on customer engagement, business agility, business insight, and transformation support. A digital core banking system helps banks get closer to their customer base. A future-proof digital core supports both a gradual moving away from legacy business applications and rapidly changing customer-facing business capabilities in the new core. As a side effect, it will widely reduce any redundant implementation of business capabilities. Combined with modern architectural approaches, the decoupling of customer interactions and data, supports constant change while reducing risk. Replacing legacy systems isn’t always necessary, Because of the enormous impact on the entire organization, re-engineering core systems and processes so they run on a digital core foundation is a smart way to achieve the same result with less impact. Implementing a flexible digital banking platform on top of a traditional core system can bring rapid returns. A product builder that simplifies and streamlines the creation of highly customizable products is the heart of a new-age digital core banking system. It allows banks to tailor products and services with a consistent and seamless experience across all channels with a strong executable workflow and orchestration capabilities. Flexibility and agility are achieved by providing the user with many configurable components. The product builder helps you to define products and assign features, such as cash account, loan, term contract and FX contracts. The products are set up using schemes and features so they can easily be reused and adapted to create new products on the fly. A future-proof digital core banking system uses claim-based security to control and manage all access. Claim-based security is a protected way to collect information on users from within the financial institution, externally from third-party organizations, and direct from the internet. Authentication mechanisms handle identity and access control, while the digital core banking system manages this using the general notion of claims along with the concept of an issuer or an authority. Interest schemes: In these schemes, the attributes of the various interest rates are defined, such as compounding information, day count fractions, holidays, and tax rules. Fee scheme: In the fee scheme, it is possible to define various types of account fees that are assigned to specific transactions on the accounts. Transactions scheme: Transactions are used to define the events during the account lifecycle when charges are applied to an account. Tax scheme: Any taxes applicable to an account are defined using this scheme, including the balance level, tax tiers, and tax rates. Payment Allocation scheme: In this scheme, it is possible to define the order of priority on payment charges made to an account which ensures that certain charges are collected first. A next-geneneration digital core banking system allows banks to integrate with third-party systems, a vital attribution when moving towards an open banking marketplace. Matrix accounts is our next-generation digital core banking platform that enables full front-to-back banking within the Matrix platform. It is a lean back-office solution that brings agility and is highly adaptable. 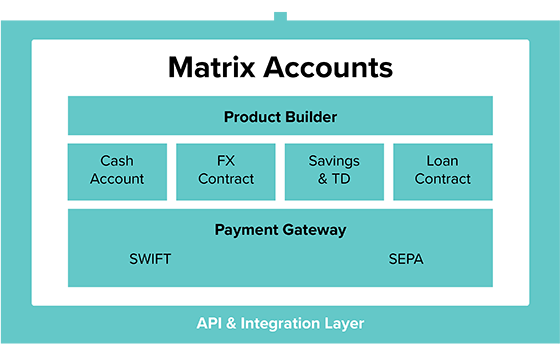 Matrix accounts enables you to quickly create and adjust banking products, such as cash accounts, term deposits, loans, and FX contracts, and to handle different payments systems, including SEPA and SWIFT. Stripping down the back-office system is achieved by taking out all customer related parts and transferring them to the Mid-office, for example workflows, emailing, and document generation.